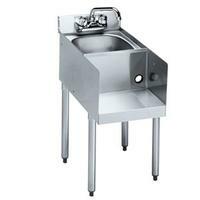 20 gauge stainless steel 10" x 14" x 6" deep with a 1-1/2" drain located in center. 1-5/8" tubular 16 gauge galvanized steel with grey plastic bullet foot. 1/2" IPS hot and cold water. 4" center splash mount faucet on 1800 models. 4" center deck mount faucet on 2100 models.